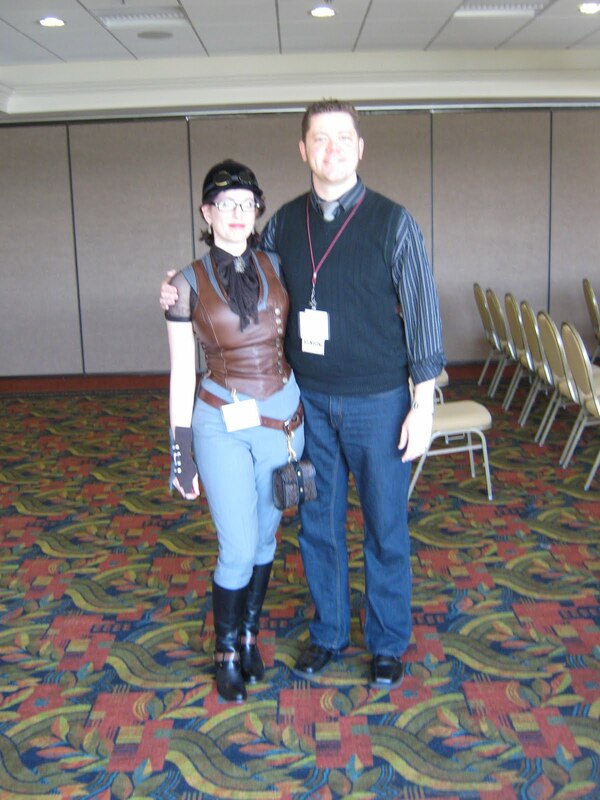 I met Gail Carriger at my first steampunk convention, Steam Powered in fall of 2008. I was on a panel about writing steampunk, which was funny to me, moderated by Ann Vandermeer, and co-paneled with Jeff Vandermeer, Ryan Galiotto of Legion Fantastique, and Gail Carriger. At the time, my impression of Gail was striking, confident, and tea-spoon dress. Yes, that infamous teaspoon dress. She spoke of the book she'd sold, set to be released the following year, and of how her writing process involves serious tea drinking. At some point, Gail and I had a photograph taken together. I'm very thankful for that photo, and wish I had a full print size of my own, since it marks the beginning of a very cool and completely unforeseen friendship. In the following year, we traded sporadic emails about the release of her book, and my interest in potentially using it as a companion novel to teaching Dracula in the spring of 2010. Sadly, with the release of the book coming too close to textbook order deadlines, I had to forgo teaching it until Winter of 2011. 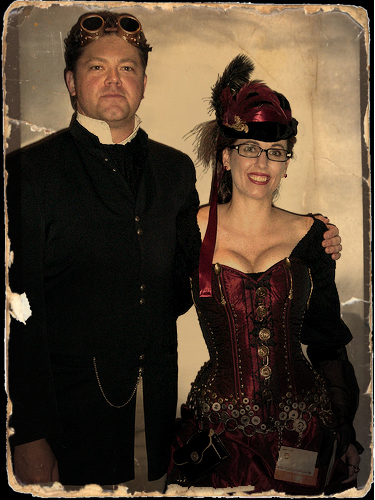 In Spring of 2010 at the Nova Albion Steampunk Exhibition, Gail provided some much-needed encouragement in the wake of a significant publishing disappointment. We didn't sit on any panels together this time around, but during one of our informal chats over the weekend, I mentioned how cool it would be to do a reading from one of her books together. She agreed that the next time we were at a con together, we'd make it happen. On the flight home, my wife started reading Soulless. Jenica rarely reads fiction, and rarer still does her reading elicit bursts of laughter. I've been reading out loud to her before bed for years, and The Parasol Protectorate became the primary series in our nightly reading from that flight onward. This proved opportune, as it provided me with ample practice with the character voices before the fall of 2010, when the stars aligned to find Gail and I at the same conference once again. Steamcon II was a blast, since it was the last time I sat around a table and shared food and drink with many West Coast steampunk friends: Chris Garcia, J. Daniel Sawyer, Paul Guinan, Anina Bennett, and Gail. I didn't know until the end of the weekend that friendship had been one of the big reasons Gail made the trip, and it was a humbling realization. While the con only gave us thirty minutes to read to a packed salon, it was worth the trip. My sister, Deanna; me; and my niece, Rio at Steamcon II. The reading was made doubly significant by two attendees from Texas: my sister Deanna and my niece Rio. I inadvertently interested my niece into Gail's books when I'd bought Soulless for my sister. 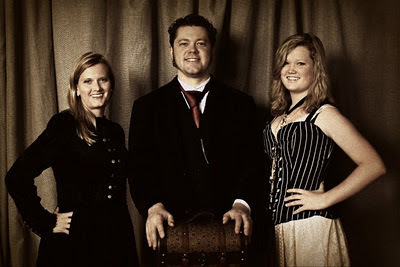 When Rio learned Gail was going to be at Steamcon, the Texans made the trip, both to support the geeky Uncle/brother, and for Rio to be the fan girl. In a moment of serendipity, Rio had the opportunity to sit next to Gail around the table Friday night while our group sat and waxed nerdoquent. Gail and I never really planned what we were going to read until the day of the reading. We'd batted ideas around, but Friday night involved copious amounts of wine, conversation, and laughter, and that's hardly the time to be hatching a plan of any sort. We settled on the opening chapter of Soulless: I played the male voices, and Gail was Alexia and narrator. My research has given me an opportunity to meet some great people and do some great things: reading with Gail combined both. I've uploaded most of that reading on You Tube. The only reason it's incomplete is my camera ran out of room. My niece has the whole thing, but we've never arranged to upload it. I interviewed Jim Blaylock that weekend, but my clearest memories are of our little group, comprised of Gail and the Bay area folk, Texans, this Canadian, and Airship Ambassador Kevin Steil; it's the weekend I realized I wasn't attending cons to "network" anymore. I was attending them to raise a glass with friends (follow this link to see a video by Christopher Garcia chronicling some of these moments). It's the reason I've been remiss to post on Gail's books since Soulless. I didn't want my endorsement to smack of favoritism. Thankfully, the world now knows how fantastic the books are, so my tribute, while late to the party, merely joins the myriad voices already praising her praiseworthy work. I don't know how long it will be before I get the chance to raise a glass with Gail in person, but until then, here's me raising a virtual one to a fantastic author and a good friend who has provided so many of us with laughter and entertainment these past three years. Let's begin the countdown to Timeless! 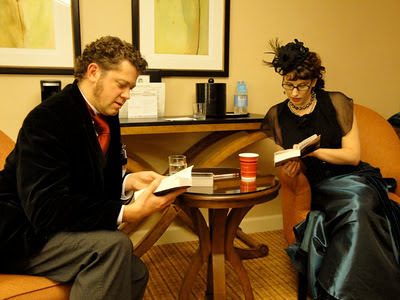 That's a great post, about how friendships can develop where you least expect them to, and also on Gail Carriger who is one of my favorite writers. Thanks for the reflections. Awe, thanks so much, Mike. Hope we get to drink together again soon.